One scene I remember inbetweening occurs after Blackstar destroys the Sphere of Souls that the Zombies Master uses to turn people into zombies. The souls of the zombies return to their rightful owners restoring them to their former selves. 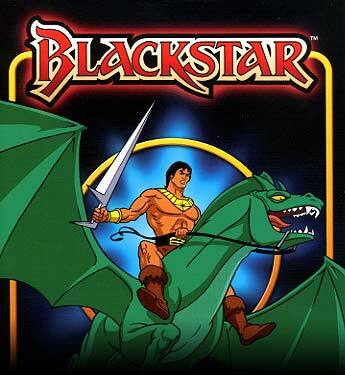 Blackstar started out to be ground-breaking as the hero originally was supposed to be black. The powers-that-be at CBS didn't think America was ready for a black hero and wanted the character changed, which I think was a huge mistake. The Trobbits were originally called Trollkins and were blue in color. BUT, Hanna-Barbera already had a show in production called The Trollkins and, of course, the Smurfs were blue. Many other colors were tried before settling on magenta pink. CBS Standards & Practices handed down one of the dumbest memos I have ever read for "Search for the Starsword." In the first part of the story, rock monsters called Lava Loks attack our heroes. As the Trobbits climb a mountainside, the script called for a couple of the little guys to lever a boulder down on the monsters. The censors would have none of that. The memo stated "the scene displayed an intent to do harm." It didn't matter that the Lava Loks intended to harm the Trobbits or that they were 4 times larger than the little guys. Never mind that it had already been established that these were unliving stones and have been smashed to bits by Blackstar in the scenes previously. The memo suggested that one of the itty bitty Trobbits accidently bump against the giant boulder so that the action is not perceived as intentional. The scene eventually was staged so that Poulo sticks out his foot and trips a monster. Whew! What excitement! What action! What stupidity! 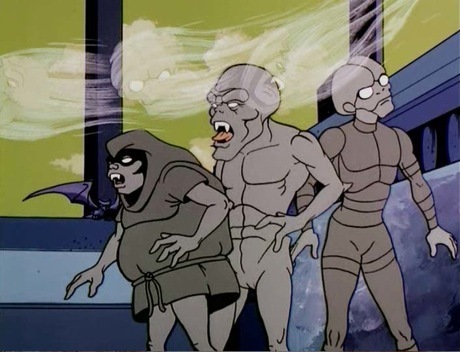 I loved Filmation's concept art and would study the walls of the Development wing whenever I could. After a while restrictions were imposed to keep upcoming series secret. Though we grumbled about the closed doors, it was understandable. We all knew people at other studios and the first thing asked is "What are you guys working on?" Bob Kline did a lot of the art while he was there. Here are two scenes of his story art from the Blackstar presentation. "Lighting City of the Clouds" made it into production with the same title. "The Serpents of Brindelle" was renamed "The Mermaid of Serpent Sea." Sadly, I only got to touch a few storyboard scenes in clean-up. This is where my weaker drawing abilities kept me out of the running. At the end of the 1981 season, Karl Geurs worked a deal to keep some of us working for six weeks as inbetweeners. By this time my drawing skills had improved somewhat. Drawing 40 hours a week for 5 months gives one lots of practice. 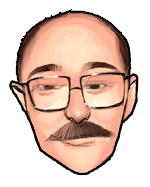 The really cool thing was the Assistant Animation Dept. had moved to the Canoga Park facility where the sets from Jason of Star Command and Space Academy, live action shows that Filmation produced in the 1970s, still stood. The desks were set up on the sci-fi sets! I wish I had taken pictures! 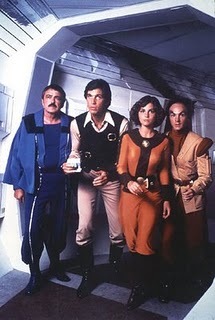 Yes, that is James Doohan (Scotty from Star Trek) on the left! To get in or out of the office we had to walk down these corridors. Many of the props and set pieces were still on the walls. Talk about inspiration! There I got to work on some of the scenes in "The Zombies Master" episode of Blackstar. The Zombies Master was cross between Sidney Greenstreet and Jabba the Hut, except we didn't get to see what Jabba looked like until two years later (1983) in Return of the Jedi. Nothing was sacred where the storyboard department was concerned. We constantly humiliated our characters with cartoons that we slid under each other's door when we were supposed to be working. Blackstar was no exception. A certain amount of this frivolity was allowed as an escape valve for frustrations and deadline pressures. We often didn't sign them because we knew each other's drawing style. Sorry, but I don't remember who did these. Here are two examples that are safe for all ages.